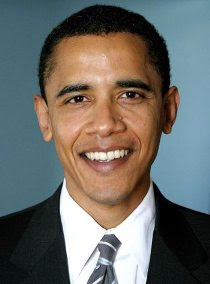 This just in: Obama is Irish. No kidding. Kenya has claimed him as one of their own, but now they have competition. Everybody loves a winner. I ran across this photo in my files of a game in progress. Trouble is, I don’t know whose game it is. I think it’s a skittles game I or someone else was playing against one of the kids in the Ray School Chess Club, and the game stopped because the next round was called and the players had to go play. I think it was Black to move. Anyway, lest a perfectly good position go to waste, I had the computer finish the game. Here’s one possible continuation. Feel free to suggest another if you’d like. Play through the whole continuation here. Black's mating attack strikes me as a bit sadistic, prolonged, and ostentatious. I mean, what would have been so bad about 9. ... Re1+ 10. Kxe1 Qxg1+? Maybe computers really can show off. But I don't know much about chess. What do you think? For people of a certain age, at any rate. Go here for Part 2. Part 3 here. And a happy Thanksgiving to you and yours. A Wacky Wednesday miniature. Who knew there was a Corn Stalk Defense? The scene was IM Angelo Young’s Touch Move Chess Center on North Ashland. 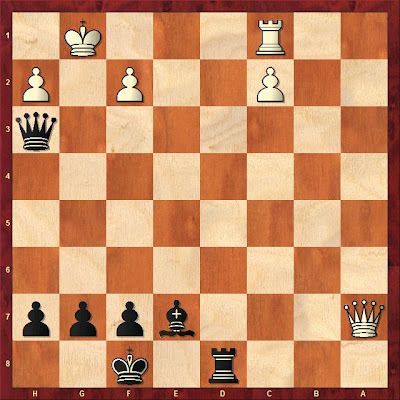 And while the victory came on time in a simul, a win is a win. 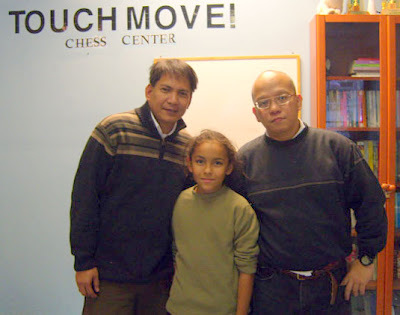 Ray’s Phillip Parker-Turner beat GM Rogelio (Joey) Antonio when the grandmaster’s flag fell in the G/30 game. Congratulations, Phillip! Another great milestone for one of Ray’s star players. More photos here. Phillip Parker-Turner gets taller every year, but so do the trophies he wins. Congratulations to Ray's George Vassilatos for winning a trophy at November 8 Youth Chess Foundation of Chicago tournament at Burbank School, and to Phillip Parker-Turner for finishing in first place in the 5th-grade section of the Illinois All-Grade Championships. More photos from the All-Grade here, courtesy of Phillip's dad. TRENTON, N.J., Nov. 20 (UPI) -- The seventh chess tournament between Princeton University and the New Jersey State Prison saw a surprising number of prisoner victories, participants said. 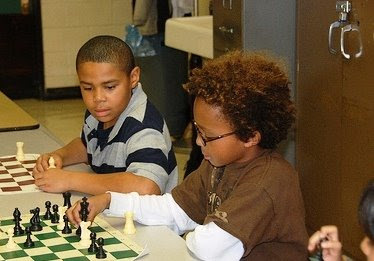 The "Inmates and Ivy" chess tournament brought six Princeton students to the prison in Trenton to test their chess skills against a collection of convicted felons and thieves, The (Newark) New Jersey Star-Ledger reported Thursday. Read more here. 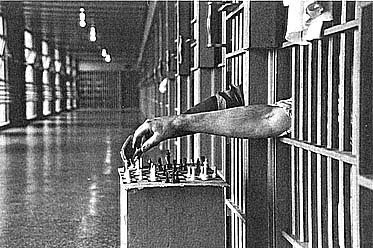 I guess it's not uncommon for college students to play prisoners in chess. They do it at Emory University, too. Coach Lamarr Wilson and chess dad Phillip Turner have captured the action at the Ray School Chess Club beautifully. Want to see more? Go to Lamarr's flickr photostream. And see the "Wilson Warriors" at Lamarr's blog. This just in from IM Angelo Young. If you'd like to try your luck playing chess against a grandmaster in a simultaneous exhibition, here's your chance. Obama Palling Around with Chess Players? 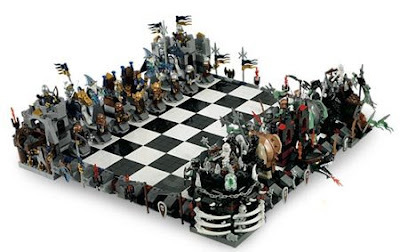 More evidence has surfaced, beyond that already available, that Barack Obama’s administration will be the Chess Presidency. Friday’s New York Times confirmed that until the massive Secret Service security bubble closed in on him following his election, the president-elect got his hair cut at the Hyde Park Hair Salon, on Blackstone just north of 53rd Street. Those familiar with the neighborhood scene know that chess is played at that establishment, yet the obvious suspicion—that Obama may go to the salon to play chess—is never mentioned in the mainstream media. Why? Considering that the Leader of the Free World can get his hair cut anywhere he wants, why does he go to this particular barbershop, if not to be around woodpushers? 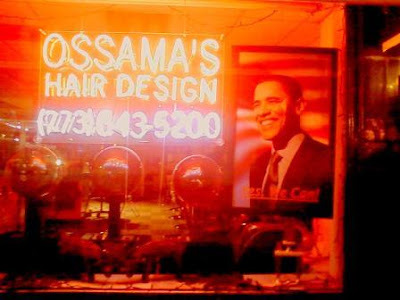 Is it just a coincidence that Obama patronized this salon? Are we to believe that the senator only went in for a trim and never once stopped to play a game of five-minute blitz? C’mon. Let's face it: the 44th president likes chess. 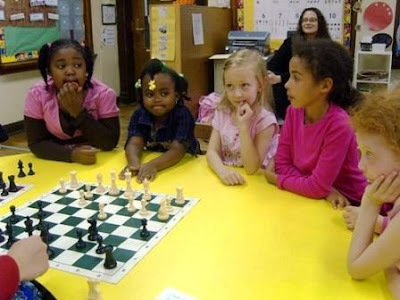 You can understand why Obama has kept mum about his ties to chess. 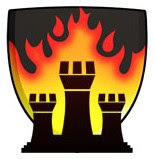 If his tenuous links to Billy Ayers were controversial during the campaign, imagine what would have happened had his connection to the Royal Game come to light. He would have been pilloried by the nation’s trogs, that's what. Just imagine: at the very moment he was being denounced as an elitist for his superior intelligence, Ivy League degrees, and impressive accomplishments, news of his affection for something as brainy as chess could have been the final nail in the coffin of his campaign. I can only assume it was a wish to keep his love of chess under wraps that led Obama to choose Joe Biden as his running mate rather than the obvious choice, Elizabeth Vicary. By the way, if you want to reach Obama on his Blackberry, better do it soon. 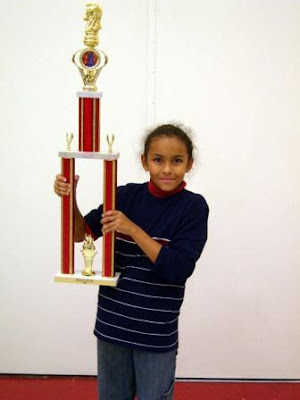 Ray School chess star Phillip Parker-Turner, winner of countless tournaments and trophies over the past five years, won another one today, finishing first in the 5th-grade section of the Illinois All-Grade Chess Championships. Congratulations, Phillip, on another triumph. Click on the screen a few times to enlarge the slide show. Rest in peace, Studs. And thank you for everything.